A gem on Lake Wakatipu. Built of local stone and solid hardwood timbers no expense has been spared to give guests a fabulous stay. The main lodge is built around a 10 metre high Great Room that looks over the turquoise blue lake to the Humboldt Mountains beyond. Lodge rooms and suites open off each end, and there are a further four suites in the garden Chalets. 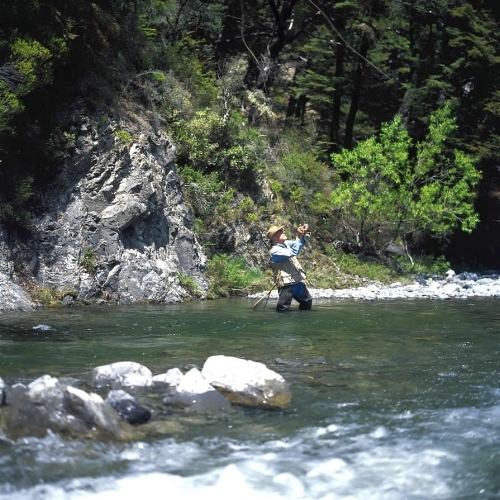 there is excellent fishing for wild brown and rainbow trout in the local rivers November through to May. There is also good fishing on the lake all year round for trout and quinnat salmon.